Greetings GEMM Lab blog readers. My name is Joe Haxel and I’m a close collaborator with Leigh and other GEMM lab members on the gray whale ecology, physiology and noise project off the Oregon coast. Leigh invited me for a guest blog appearance to share some of the acoustics work we’ve been up to and as you’ve probably guessed by now, my specialty is in ocean acoustics. I’m a PI in NOAA’s Pacific Marine Environmental Laboratory’s Acoustics Program and OSU’s Cooperative Institute for Marine Resources Studies where I use underwater sound to study a variety of earth and ocean processes. As a component of the gray whale noise project, during the field seasons of 2016 and 2017 we recorded some of the first measurements of ambient sound in the shallow coastal waters off Oregon between 7 and 20 meters depth. In the passive ocean acoustics world this is really shallow, and with that comes all kinds of instrument and logistical challenges, which is probably one of the main reasons there is little or no acoustic baseline information in this environment. For instance, one of the significant challenges is rooted in the hydrodynamics surrounding mobile recording systems like the drifting hydrophone we used during the summer field season in 2016 (Fig 1). Decoupling motion of the surface buoy (e.g., caused by swell and waves) from the submerged hydrophone sensor is critical, and here’s why. Hydrophones convert pressure fluctuations at the sensor/ water interface to a calibrated voltage recorded by a logging system. Turbulence resulting from moving the sensor up and down in the water column with surface waves introduces non-acoustic pressure changes that severely contaminate the data for noise level measurements. Vertical and horizontal wave motions are constantly acting on the float, so we needed to engineer compliance between the surface float and the suspended hydrophone sensor to decouple these accelerations. To overcome this, we employed a couple of concepts in our drifting hydrophone design. 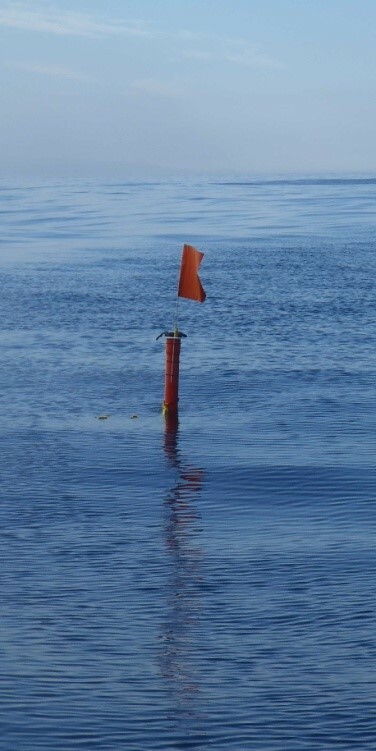 1) A 10 cm diameter by 3 m long spar buoy provided floatation for the system. Spar buoys are less affected by wave motion accelerations compared to most other types of surface floatation with larger horizontal profiles and drag. 2) A dynamic shock cord that could stretch up to double its resting length to accommodate vertical motion of the spar buoy; 3) a heave plate that significantly reduced any vertical motion of the hydrophone suspended below it. This was a very effective design, and although somewhat cumbersome in transport with the RHIB between deployment sites, the acoustic data we collected over 40 different drifts around Newport and Port Orford in 2016 was clean, high quality and devoid of system induced contamination. Figure 1. The drifting hydrophone system used for 40 different drifts recording ambient noise levels in 7-20 m depths in the Newport and Port Orford, OR coastal areas. Spatial information from the project’s first year acoustic recordings using the drifting hydrophone system helped us choose sites for the fixed hydrophone stations in 2017. Now that we had some basic information on the spatial variability of noise within the study areas we could focus on the temporal objectives of characterizing the range of acoustic conditions experienced by gray whales over the course of the entire foraging season at these sites in Oregon. 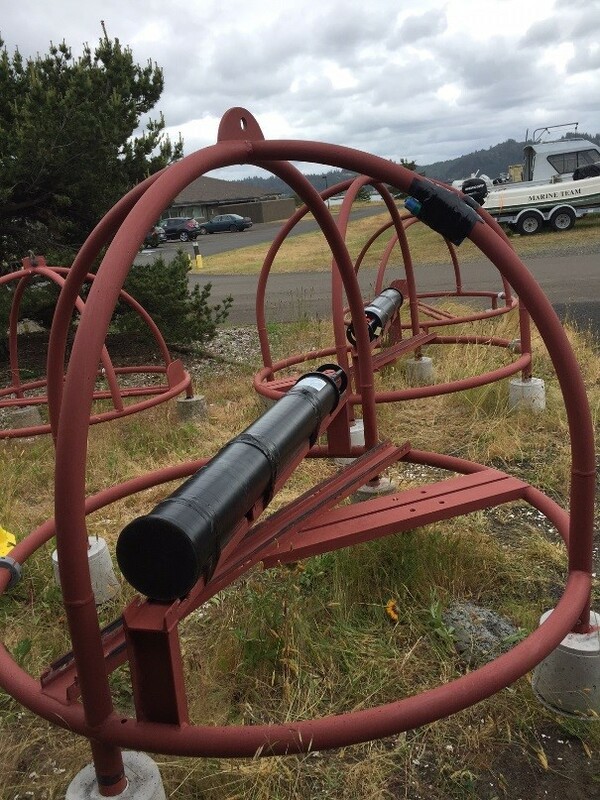 In 2017 we deployed “lander” style instrument frames, each equipped with a single, omni-directional hydrophone custom built by Haru Matsumoto at our NOAA/OSU Acoustics lab (Fig. 2). 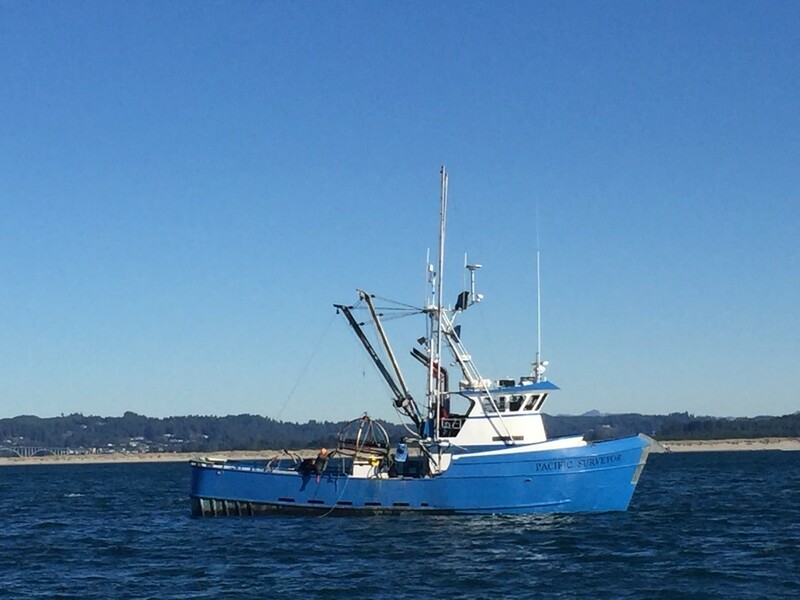 The four hydrophone stations were positioned near each of the ports (Yaquina Bay and Port Orford) and in partnership with the Oregon Department of Fish and Wildlife Marine Reserves program in the Otter Rock Marine Reserve and the Redfish Rocks Marine Reserve. The hydrophones were programmed on a 20% duty cycle, recording 12 minutes of every hour at 32 kHz sample rate, providing spectral information in the frequency band from 10 Hz up to a 13 kHz. Figure 2. The hydrophone (black cylinder) on its lander frame ready for deployment. Here’s where the story gets interesting. In my experience so far putting out gear off the Oregon coast, anything that has a surface expression and is left out for more than a couple of weeks is going to have issues. Due to funding constraints, I had to challenge that theory this year and deploy 2 of the units with a surface buoy. This is not typically what we do with our equipment since it usually stays out for up to 2 years at a time, is sensitive, and expensive. The 2 frames with a surface float were going to be deployed in Marine Reserves far enough from the traffic lanes of the ports and in areas with significantly less traffic and presumably no fishing pressure. 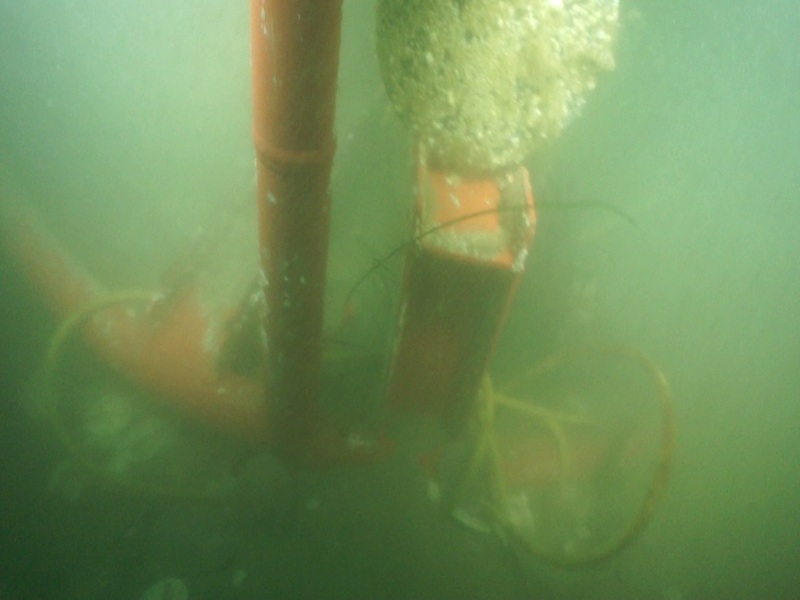 The surface buoy consisted of an 18 inch diameter hard plastic float connected to an anchor that was offset from the instrument frame by a 150 foot weighted groundline. 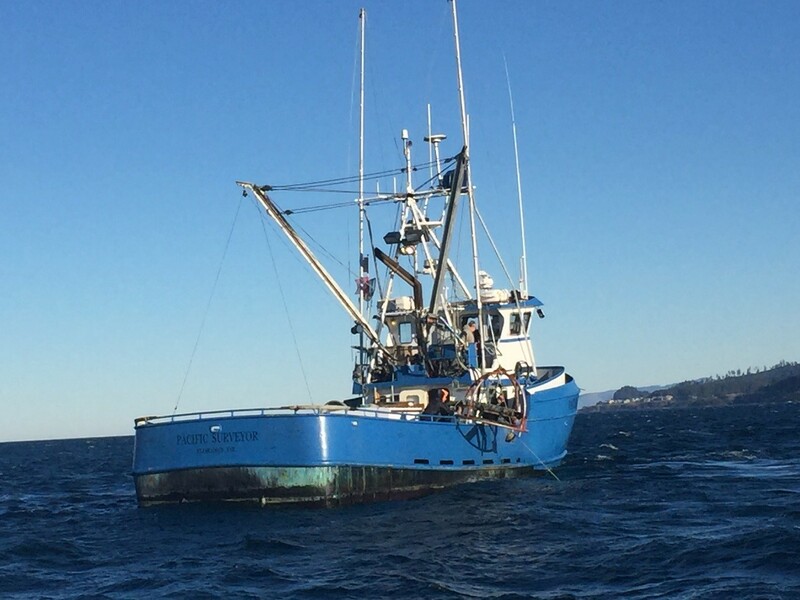 The gear was deployed off Newport in June and Port Orford in July. What could go wrong? After monthly buoy checks by the project team, including GPS positions, and buoy cleanings my hopes were pretty high that the surface buoy systems might actually make it through the season with recoveries scheduled in mid-October. Had I gambled and won? Nope. The call came in September from Leigh that one of the whale watching outfits in Depoe Bay recovered a free floating buoy matching ours. Bummer. Alternative recovery plans initiated and this is where things began to get hairy. Fortunately, we had an ace in our back pocket. 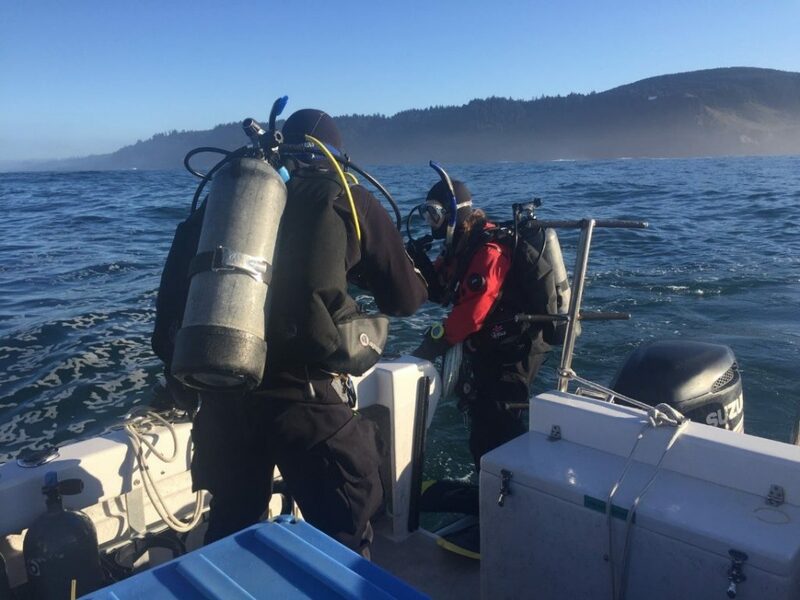 We have collaborators at the Oregon Coast Aquarium (OCA) who have a top-notch research diving team led by Jim Burke. 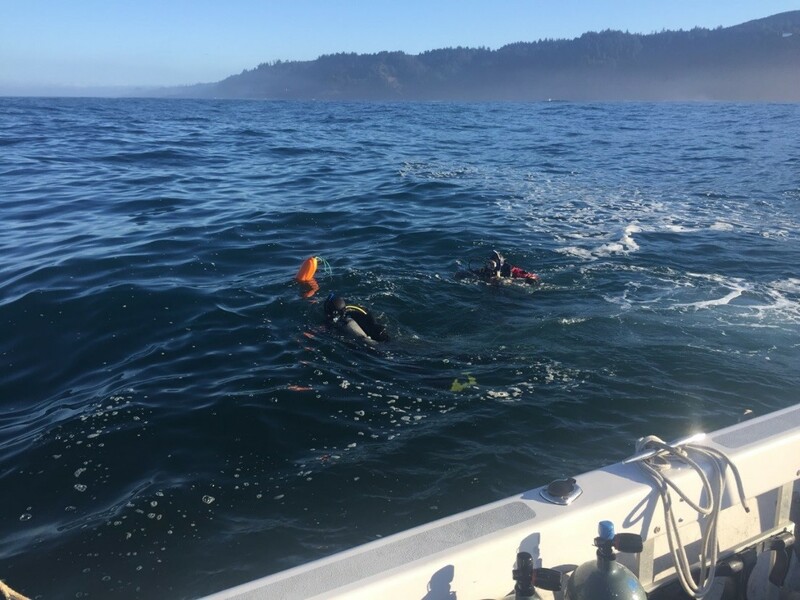 In the last week of October, they performed a successful search dive on the missing unit near Gull Rock and attached a new set of floats directly to the instrument frame. The divers were in the water for a short 20 minutes thanks to the good series of marks recorded during the buoy checks throughout the summer (Fig. 3). Figure 3. OCA divers, Jenna and Doug, heading out for a search dive to locate and mark the Gull Rock hydrophone lander. We had surface marker floats on the frame, but there was a new problem. Video taken by Jenna and Doug from the OCA dive team revealed the landers were pretty sanded in from a couple of recent October storms (Fig. 4). Ugghhh! Figure 4. Sanded in lander at Gull Rock. Notice the sand dollars and bull kelp wrapped on the frame. Alternative recovery plan adjustment: we’re gonna need a diver assisted recovery with 2 boats. One to bring a dive team to air jet the sand out away from the legs of the frame and another larger vessel with pulling power to recover the freed lander. Enter the R/V Pacific Surveyor and Capt. Al Pazar. Al, Jim and I came up with a new recovery plan and only needed a decent weather window of a few hours to get the job done. Piece of cake in November off the Oregon coast, right? The weather finally cooperated in early December in-line with the OCA dive team and R/V Pacific Surveyor’s availability. The 2 vessels and crew headed up to Gull Rock for the first recovery operation of the day. At first we couldn’t locate the surface floats. Oh no. It seemed the rough fall/ winter weather and high seas since late October were too much for the crab floats? As it turns out, we eventually found the floats eastward about 200 m but couldn’t initially see them in the glare and whitecapping conditions that morning. 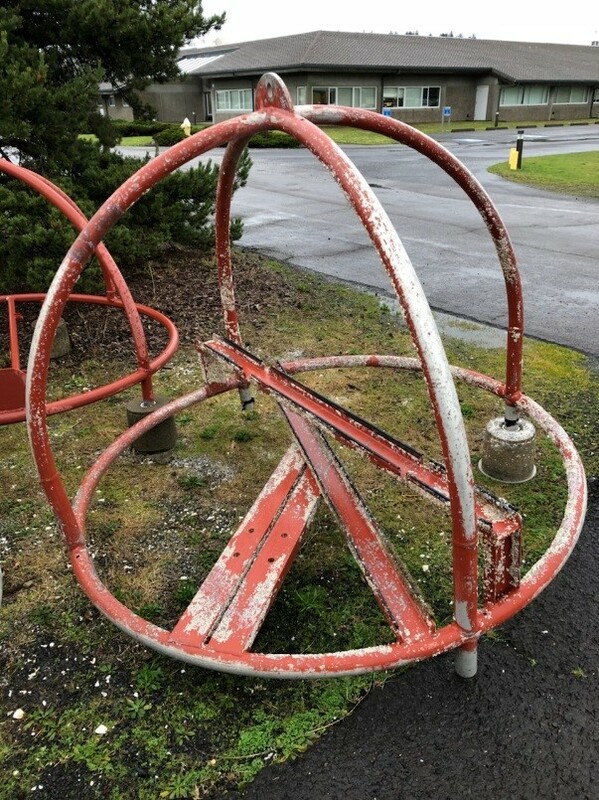 The lander frame had broken loose from its weakened anchor legs in the heavy weather (as it was designed to do through an Aluminum/ Stainless Steel galvanic reaction over time) and rolled or hopped eastward by about 200 m (Fig. 5). Oh dear! Figure 5. A hydrophone lander after recovery. Notice all but 1 of the concrete anchor legs missing from the recovered lander and the amount of bio-fouling on the hydrophone (compared to Figure 2). Thankfully, the hydrophone was well protected, and no air jetting was required. With OCA divers out of the water and clear, the Pacific Surveyor headed over to the floats and easily pulled the lander frame and hydrophone on board (Fig. 6). Yipee! On to the next hydrophone station. This station, deployed ~ 800 m west of the south reef off of South Beach near the Yaquina Bay port entrance. It was deployed entirely subsurface and was outfitted with an acoustic release transponder that I could communicate with from the surface and command to release a pop-up messenger float and line for eventual recovery of the instrument frame. Once on station, communication with the release was established easily (a good start) and we began ranging and moving the OCA vessel Gracie Lynn in to a position within about 2 water depths of the unit (~40 m). I gave the command to the transponder and the submerged release confirmed it was free of its anchor and heading for the surface, but it never made it. Uh oh. Turns out this lander had also broke free of its anchored legs and rolled/ hopped 800 m eastward until it was pinned up against the boulder structure of the south reef. Amazingly, OCA divers Jenna and Doug located the messenger float ~ 5 m below the surface and the messenger line had been fouled by the rolling frame so it could not reach the surface. They dove down the messenger line and attached a new recovery line to the lander frame and the Pacific Surveyor hauled up the frame and hydrophone in-tact (Fig. 6). Double recovery success! Figure 6. R/V Pacific Surveyor recovering hydrophone landers off Gull Rock and South Beach. The hydrophone data from both systems looks outstanding and analysis is underway. This recovery effort took a huge amount of patience and the coordination of 3 busy groups (NOAA/OSU, OCA, Capt. Al). 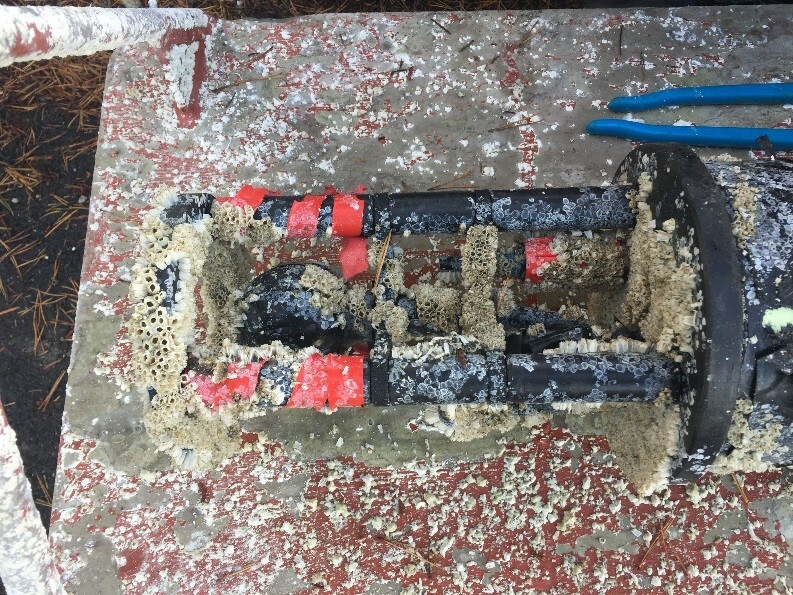 Thanks to these incredible collaborations and some heroic diving from Jim Burke and his OCA dive team, we now have a unique and unprecedented shallow water passive acoustic data set from the energetic waters off the Oregon coast. So that’s some of the story from the 2016 and 2017 field season acoustic point of view. I’ll save the less exciting, but equally successful instrument recoveries from Port Orford for another time. It was March 15th, 2000; Kenneth Balcomb was drinking coffee with his new summer interns in the Bahamas when a goose-beaked whale stranded on a nearby beach. 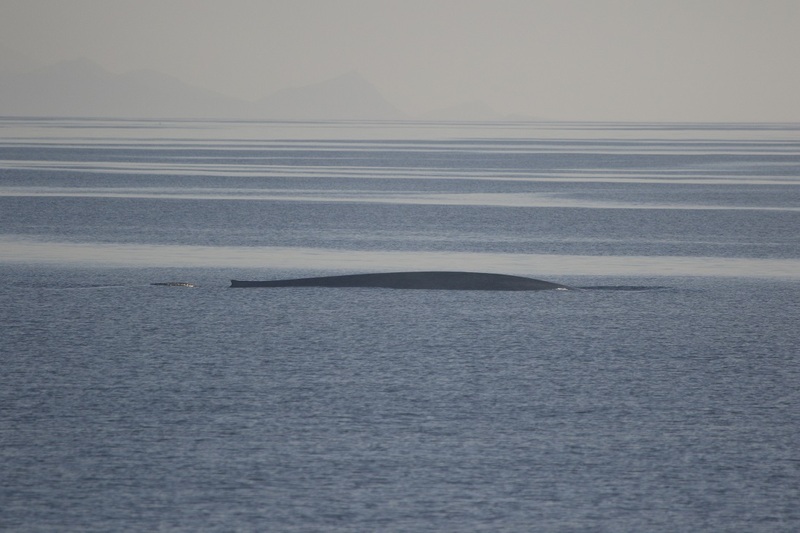 Balcomb, a whale researcher and former U.S. Navy Officer, gently pushed the whale out to sea but the beaked whale kept returning to the shore. He continued this process until a second beaked whale stranding was reported further down the beach; and then a third. Within hours, 17 cetaceans had stranded in the Bahamas trying to escape ‘something’ in the water, and Kenneth Balcomb was determined to solve the mystery of the mass stranding. The cause, he eventually learned, was extreme noise – sonar tests from Navy Warships. The world is buzzing with the sounds of Earth’s creatures as they are living, interacting, and communicating with one another, even in the darkest depths of the oceans. Beneath the surface of our oceans lies a finely balanced, living world of sound. To whales, dolphins and other marine life, sound is survival; the key to how they navigate, find mates, hunt for food, communicate over vast distances and protect themselves against predators in waters dark and deep. Yet, this symphony of life is being disrupted and sadly destroyed, by today’s increasing noise pollution (Figure 1). Human activities in the ocean have exploded over the past 5 decades with ocean noise rising by 3db per decade (Halpern et al. 2008). People have been introducing more and more noise into the ocean from shipping, seismic surveys for oil and gas, naval sonar testing, renewable energy construction, and other activities. This increased noise has significant impacts on acoustically active and sensitive marine mammals. However, as the Discovery Chanel’s new documentary Sonic Sea points out “The biggest thing about noise in the ocean is that humans aren’t aware of the sound at all.” The increase of ocean noise has transformed the delicate ocean habitat, and has challenged the ability of whales and other marine life to prosper and survive. Like the transformative documentary from 10 years ago, An Inconvenient Truth, which highlighted the reality and dangers of climate change, Sonic Sea aims to inform audiences of increased man-made noise in the oceans and the harm it poses to marine animals. The Hatfield Marine Science Center and Oregon Chapter of the American Cetacean Society offered a free, premier showing of the award-winning documentary followed by a scientific panel discussion. The panel featured Dave Mellinger, Joe Haxel, and Michelle Fournet of Oregon State University’s Cooperative Institute for Marine Resources Studies (CIMRS) marine bioacoustics research along with GEMM Lab leader, Leigh Torres, of the Marine Mammal Institute. Sonic Sea introduces us to this global problem of ocean noise and offers up solutions for change. The film uncovers how better ship design, speed limits for large ships, quieter methods for under water resource exploration, and exclusion zones for sonar training can work to reduce the noise in our oceans. However, these efforts require continued innovation and regulatory involvement to bring plans to action. Around the world the scientific community, policymakers and authorities such as The National Oceanic and Atmospheric Administration (NOAA), the European Union (EU), the International Maritime Organization (IMO) and other authorities have increasingly pressed for the reduction of noise. NOAA, which manages and protects marine life in United States waters, is trying to reduce ocean noise through their newly released Ocean Noise Strategy Roadmap, where the challenge is dealt with as a comprehensive issue rather than a case-by-case basis. This undersea map is a 10-year plan that aims to identify areas of specific importance for cetaceans and the temporal, spatial, and frequency of man-made underwater noise. After obtaining a more comprehensive scientific understanding of the distributions and effects of noise in the ocean, these maps can help to develop better tools and strategies for the management and mitigation of ocean noise. Sonic Sea states “we must protect what we love” but then asks “how we can love it if we don’t understand it?” Here at GEMM Lab and the Marine Mammal Institute, we are trying to understand marine species ecology, distributions and behavioral responses to anthropogenic impacts. One of the suggestions Sonic Sea makes to reduce the impact of ocean noise is to restrict activity in biologically sensitive habitats. Therefore, we must know where these important areas are. In an ideal world, we would have a good inventory of data on the marine animals present in a region and when these animals breed, birth and feed. Then we could use this information to guide marine spatial planning and management to keep noise out of important habitats. 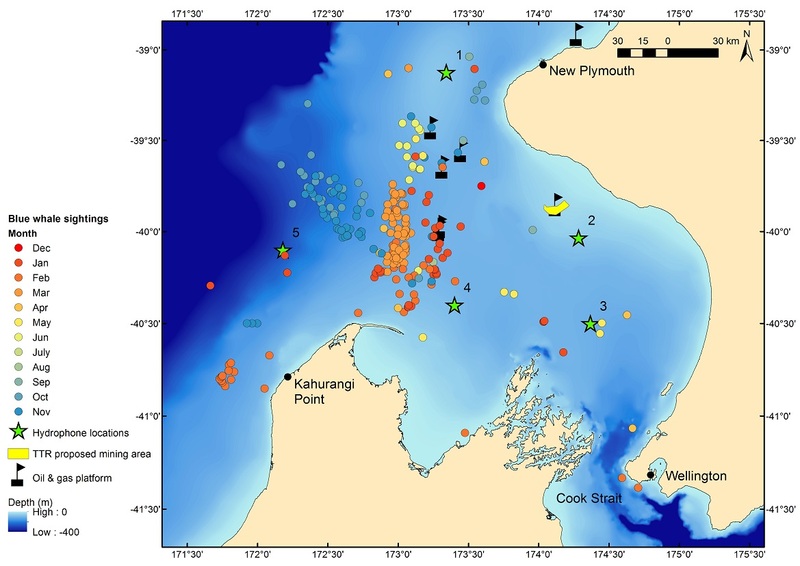 My thesis project aims to provide such baseline information on harbor porpoise distribution patterns within a proposed marine energy development site. By filling knowledge gaps about where marine animals can be found and why certain habitats are critical, conservation efforts can be more directed and effective in reducing threats, such as ocean noise, to marine mammals. Noise in our oceans is hard to observe, but its effects are visibly traumatic and well-documented. Unlike other sources of pollution to our oceans, (climate change, acidification, plastic pollution), which may take years, decades or centuries to dissipate, reducing ocean noise is rather straight forward. “Like a summer night when the fireworks end, our oceans can quickly return to their natural soundscape.” Ocean noise is a problem we can fix. To quiet the world’s waters, we all need to raise our voices so policy makers hear of this problem. That’s what Sonic Sea is all about: increasing awareness of this growing threat and building a worldwide community of citizen advocates to help us turn down the volume on undersea noise. If we sit back and do nothing to mitigate oceanic noise pollution, the problem will likely worsen. I highly suggest watching Sonic Sea. Then, together, we can speak up to turn down the noise that threatens our oceans — and threatens us all. Sonic Sea airs TONIGHT (6/8) for World Ocean’s Day on Animal Planet at 10pm ET/PT!